Old Fashion with No Salt added or the Hot Cream Style that's country fresh and now Kosher Certified. Add to potato toppings, barbeque hamburgers, omelets, and egg dishes. For savory roast beef, spread on the meat during the last hour of cooking. I used to live next to Tulelake. That is how I found this. I love it and our Safeway quit selling it. :( Can I get your recipe for deviled eggs with the horseradish? 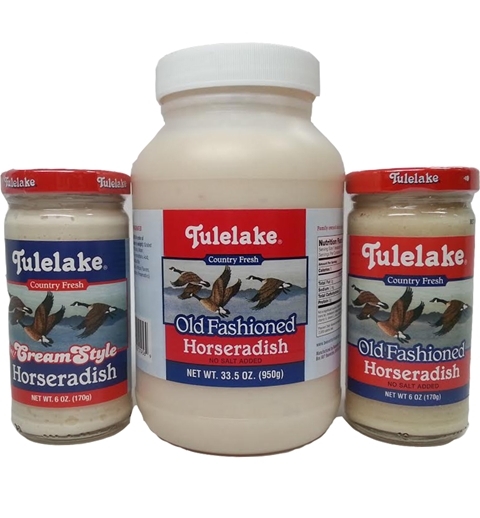 Tulelake Old Fashioned Horse Radish has been the "Gold" standard ingredient for devilled eggs for over forty years. We can't buy it in Kentucky, so we buy it on-line. Devilled eggs just aren't the same with any other brand.